With his design for Click, Alberto Meda created a functional and robust folding table. hanks to the flat folding mechanism and elegant lines of the legs, Click does not look like an ordinary folding table – and for added convenience, its legs can be folded up and down by simply pressing a button. It is available in three sizes as well as in a practical set of ten tables with a stacking trolley that holds all ten tables. Click is a functional and robust folding table that Vitra created with the engineer and designer Alberto Meda. Its legs can be folded up and down by simply pressing a button. Because of the flat folding mechanism and the elegant lines of the legs, Click does not look like an ordinary folding table. The recessed folding device also allows for space-saving storage. Up to ten tables can be stacked on the trolley. Click is available in three sizes as well as in a practical set of ten tables with a stacking trolley. Supporting material for table tops Description: honeycomb sandwich panel. The honeycomb structure is sandwiched between 4-mm-thin particle boards and reinforced by bonded aluminium studs where it connects with the substructure. 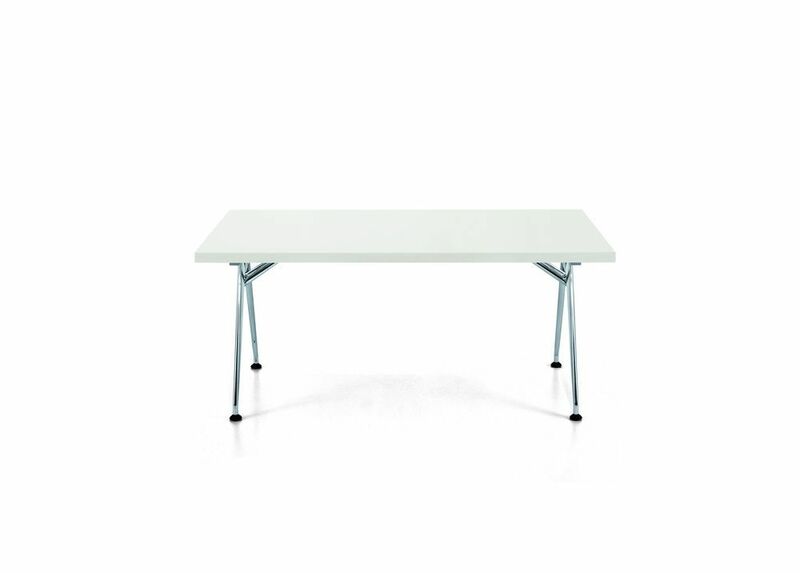 The honeycomb structure keeps the weight of these folding tables low (W 1,600 x D 800 mm, 22 kg, W 1,800 x D 900 mm, 28 kg).